Welcome to where It's All About YOUR Wedding Ceremony. ​Who is All About the Ceremony? What is All About the Ceremony? Over the years, I've collected many wedding ceremony scripts, unity ceremony scripts, readings and vow options. 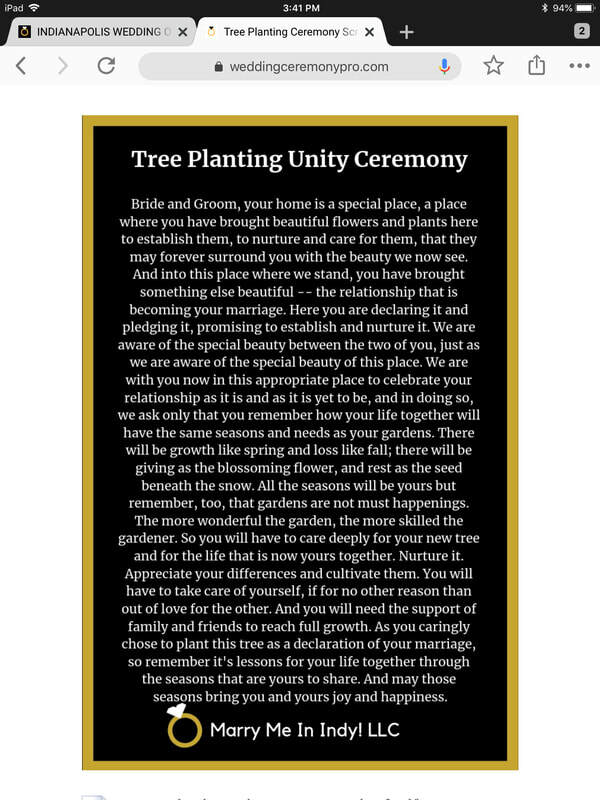 They were sitting on my computer and Google Drive and I was using them to personalize ceremonies or to share with couples as options for their ceremonies. Finally, I decided that I would organize all of the information I'd collected, gather more, organize it, and present it so anyone can use it. It's a resource for me, the couples I marry, and anyone else who would like to use it. This is an ongoing process! Where did you get all this ceremony information? I think every wedding ceremony starts with a good Google search. There is a LOT of wedding ceremony information spread out all over the internet. Wedding officiants gather their own information that they like and put it on their websites, there are collections of readings and vows on blogs all over the place. I've had couples bring me some of the best ceremonies I use. I've put them in Google search and found where they came from. When I was gathering prewritten ceremonies I saw the pattern of rewritten phrases repeated in some way in another ceremony. That's why you don't see a lot of wedding ceremony books. Who really owns it? It's just there. Some of the the most popular wedding ceremony readings come from either the Bible - which is an open source, or from many wonderful authors. You can acknowledge the author on a website and link to them but publishing their work in a book is a whole different thing. I really wanted to gather as much wedding ceremony information that I could so I could have it all in one place. You don't have to go from site to site, and then try to remember where you found it. The biggest challenge is organizing all the wedding ceremony information. Most people search the internet on their phones, so, I decided to put all of the different pieces of a wedding ceremony in jpg form so you can read one piece at a time on the screen of your phone. If you like it, you can either download the file or screenshot it. You can literally, put your whole wedding ceremony together on your phone in pictures. You can pick your vows, ring exchanges, readings, prayers, unity ceremonies in a collection of pictures. The pictures are created so they are readable. ​Don't like the picture option? No phone or iPad? No problem! I've created a PDF for every option you can just download and print out. I think these options are a lot easier for most people to use. Don't like PDF's or using a handheld device? Want a good old cut and paste option? ​ No worries! I'm currently updating every page with either the text or a link to the text. If there is a lot of information on a page, there's a link. It makes it makes it much more user-friendly and the pages load faster. When I first meet with a couple they usually have no idea what goes into their wedding ceremony. I ask questions to get a feel for who they are and how they picture their wedding ceremony. Then, I point them in the direction of a pre-written ceremony that I think will suit their needs. Then, I give them different options they may want to exchange within the ceremony to suit their personality.